Ongoing population growth and the urban sprawl it generates continue to devour California’s and America’s productive farmland. Arable lands with rich topsoil and adequate water that can produce food sustainably with minimal inputs are one of our greatest natural resources and economic assets. Good cropland, especially, is a scarce resource. Globally, only about 11 percent of the Earth’s land area is used for crops. Approximately 15 percent of the U.S. surface area is cropland, and that percentage is declining. Unfortunately, the fact that cropland tends to be flat or only gently sloped makes it easier and cheaper to build on than hillier areas. Moreover, much good farmland lies directly in the path of expanding cities. Thus, around the world, farmland, and especially cropland, is threatened by the bulldozer’s blade, by development that is. The American Farmland Trust (AFT) reports that more than 40 acres of farm and ranchland are bulldozed and paved every hour in the U.S. – at a rate of nearly a thousand acres a day. It is a level of loss that is as alarming as it is unsustainable. 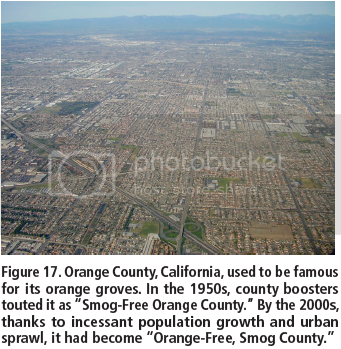 In California alone, between 1982 and 2012 – just three decades – urban sprawl obliterated an additional 3,400 square miles (2.2 million acres) of open space. If each of these 2.2 million acres – in the shape of a square 209 feet on a side (about the area of a football field) – were placed end to end, they would stretch across the United States all the way from the Pacific to the Atlantic, not just once, but three times. All of this developed land was once farmland or wildlife habitat, or both, representing an incalculable loss of potential food production and ecological functions. According to AFT, about half of America’s protected wildlife species depend on private working lands for 80 percent or more of their habitat. During this same period (1982 to 2012), California’s already swollen population grew by an additional 13 million people from 25 million to 38 million. This increase in the number of California residents – each of whom consumes land for housing, workplaces, schools, transportation, commerce, utilities and other urban land uses accounted for more than 90 percent of the sprawl. Hyper-populated California is far from unique. Analyzing data on developed land from the 2012 National Resources Inventory (NRI) of the U.S. Department of Agriculture’s (USDA’s) Natural Resources Conservation Service (NRCS), in conjunction with population estimates from the U.S. Census Bureau (USCB), between 2002 and 2012, 85 percent of the sprawl in the Lower 48 States was related to population growth. 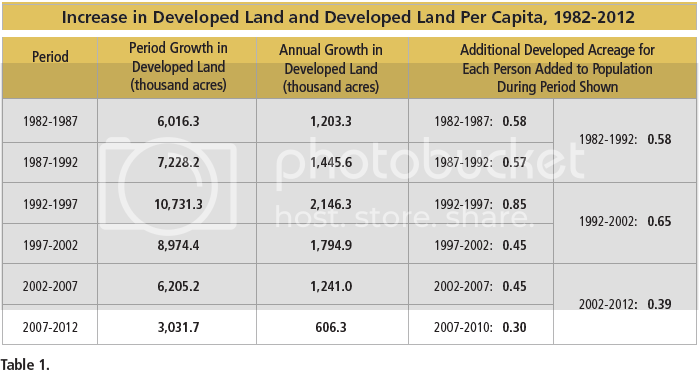 Just 15 percent was attributable to increasing per capita land consumption (for larger houses and yards, etc.) 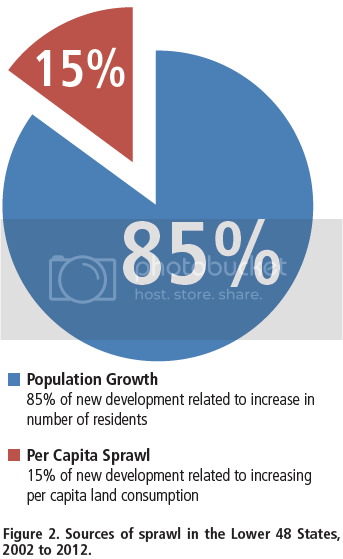 or decreasing population density (Figure 2). that the chief villain behind sprawl is the bottomless appetite of greedy, gluttonous Americans for ever larger “McMansions” and “Downton Abbey”-style estates. Every evening, according to this crude stereotype, the white patrician males who own these estates clog America’s congested freeways as they head home in their gleaming SUVs, BMWs and Mercedes Benzes to their sprawling manors. This wrongheaded, politically correct caricature ignores the true culprit in contemporary sprawl: unending, mounting immigration-driven population growth. If current trends continue, the outlook is ominous. Figure 3 shows the projected longterm decline in cropland per person from 1982 to 2100. By 2100, there would be just 0.3 acres of cropland per capita compared to 1.9 acres per capita in 1982. It would take a technological miracle to increase crop yields (production per acre) six-fold to compensate for this decline in cropland per capita, especially in view of the additional challenges of erosion, soil fertility declines, diminishing returns on fertilizers and pesticides, climate change-induced soil moisture stress, and reduced availability of fossil fuels for fertilizer and water for irrigation. Not even Nobel Laureate Norman Borlaug, “Father of the Green Revolution,” believed that infinite innovation in agriculture could outrun infinite population growth. A key, if neglected, element in safeguarding our farmland and our long-term food security is stopping the population growth and the sprawl that undermine them both. Using two entirely different methodologies, two distinct federal agencies – the USCB and the NRCS – have collected extensive data for decades that are useful in calculating the progressive loss of farmland and open space to urban sprawl over time. Since 1950, USCB has kept track of so-called Urbanized Land, consisting of larger Urbanized Areas (UAs) and smaller Urban Clusters (UCs), in conjunction with the decennial censuses (1950, 1960, 1970, 1980, 1990, 2000 and 2010). The NRCS began inventorying the increase of Developed Land in 1982 as part of its NRIs. 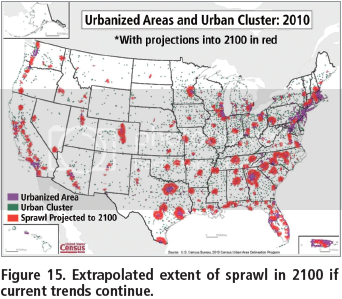 In spite of both anti-sprawl initiatives (collectively known as “smart growth”) and economic setbacks over the last decade that have somewhat slowed the pace of urban sprawl in the U.S., large areas of rural land and natural habitats continue conversion into urbanized or developed land. In fact, from 2002 to 2012, almost 9.2 million acres (approximately 14,335 square miles) – an area larger than Maryland – were developed. From 1982 to 2012, 42.2 million acres (approximately 65,920 square miles) – an area approximately equivalent to the state of Florida – of previously undeveloped non-federal rural land was built on to accommodate America’s growing cities and towns. 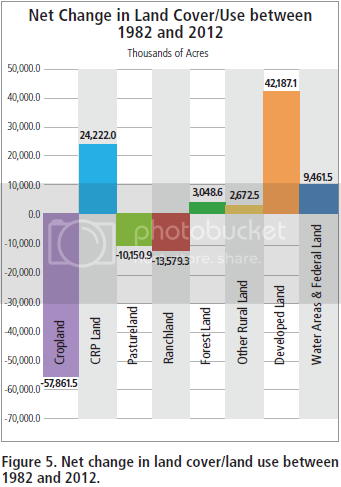 Over a slightly shorter period, the quarter-century from 1982 to 2007, of the 41.3 million acres lost – or “converted,” to use the euphemism employed by land use planners – 17.7 million acres were forestland, 10.1 million acres cropland, and 12.3 million acres pasture and rangeland (Figure 4). 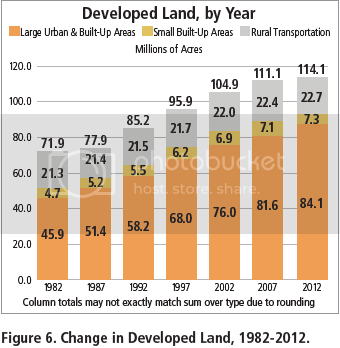 Figure 5 is a chart depicting the net changes in land cover and land use in the U.S. from 1982 to 2012. By far, the two greatest changes are the decline in cropland of 57,861,500 acres and the growth in developed land of 42,187,100 acres. The annual increase in Developed Land over this 30-year period varied from 600,000 acres to 2,159,000 acres, and averaged 1.4 million acres/year. 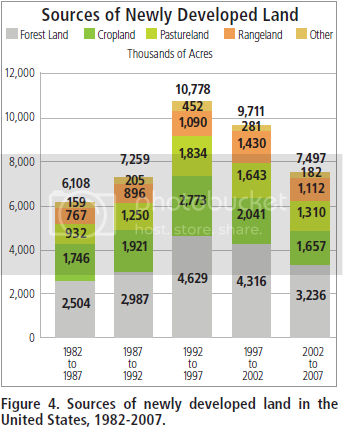 The low of 600,000 acres/year was the annual average for the 2007 to 2012 period, corresponding to the Great Recession. The right column of Table 1 shows the average amount of open space that was developed to accommodate the addition of each extra person to the U.S. population during the designated period. The land developed for each additional U.S. resident ranged from a low of 0.3 acre during the 2007 to 2010 period to a high of 0.85 acre during the 1992 to 1997 period. The average was 0.53 acre for the entire 28-year period of study. In essence, every additional person added to the U.S. population entails the development of about half an acre of farmland or natural habitat. Table 1 dissects the data presented in Figure 6. The rate of sprawl peaked in the 1990s at more than 2.1 million acres per year, as did the amount of sprawl for each new person added to the U.S. population. The U.S. population and cities have both grown many-fold since the country’s origins in the 18th century. 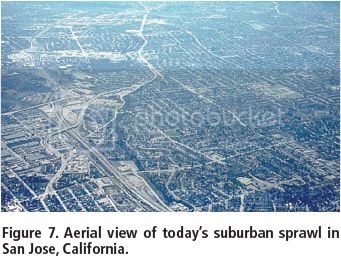 Yet after World War II, especially in the 1950s and 1960s, the combination of explosive population and economic growth – fueled by the Baby Boom, pentup consumer demand, federal policies and cheap gasoline – resulted in the new phenomenon of urban (or suburban) sprawl: the accelerated outward expansion of cities and their surrounding suburbs along the periphery (Figure 7). Developers touted the suburbs as combining the best of both country and city living. 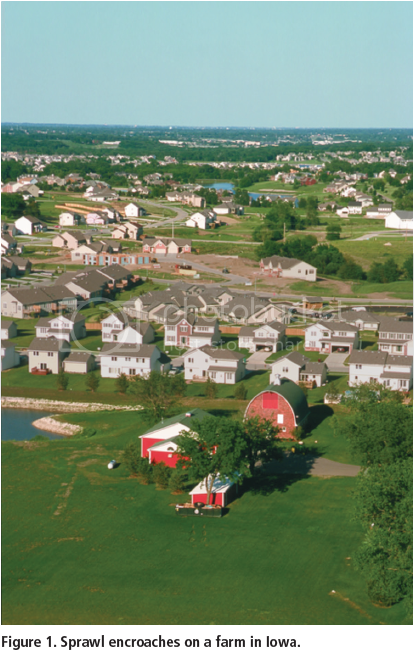 Lower residential densities and higher population growth interacted synergistically to increase the consumption and conversion rate of open space, countryside and farmland. According to the NRI, by 2012, developed land comprised about 8 percent of all non-federal land in the U.S., up from 5 percent in 1982. In California, by 2012, developed land comprised about 12 percent of all non-federal lands, up from 8 percent in 1982. 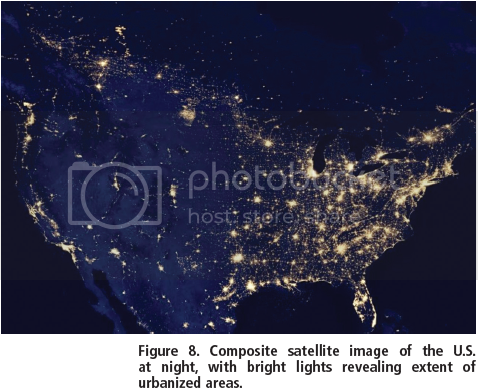 A sense of relative proportion is provided visually by Figure 8, a recent composite satellite image of the U.S. at night, and Figure 9 from the USCB, which depicts all urbanized lands (UAs and UCs) in 2010. The brightly lit zones of Figure 8 correspond closely to the distribution of UAs and UCs of Figure 9, and are heavily concentrated along the East, West and Gulf Coasts, as well as portions of the South and margins of the Great Lakes. Similarly, Figure 8’s bands of relative darkness that predominate over much of the West (approximately west of the 100th Meridian) in the High Plains, Rocky Mountains, and Southwestern deserts match the location of Figure 9’s more widely scattered Urbanized Areas and Urban Clusters. These darkish areas indicate a much lower population density and the widespread presence of arid deserts, rugged mountains and vast areas of both irrigated and dryland agricultural hinterlands that produce food that feeds hundreds of millions of residents congregated in America’s cities (to say nothing of millions of others around the world who rely on American agricultural exports). 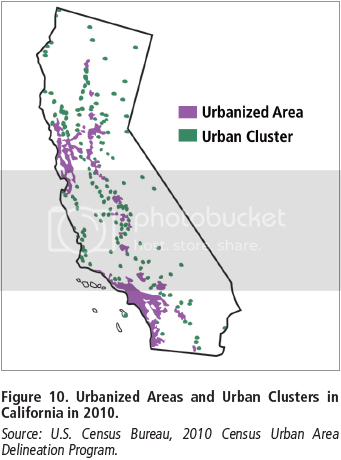 Figure 10 focuses on UAs and UCs in California alone in 2010. One can readily make out the metropolitan areas of San Diego, Los Angeles (including Orange, San Bernardino and Riverside counties), San Francisco Bay and Sacramento. Conversion to developed land is not the only cause of the degradation and disappearance of high-quality agricultural land. Arable land is also vulnerable to other damaging natural and anthropogenic forces such as soil erosion from wind and water, and salinization and waterlogging from irrigation, which can compromise the fertility, productivity, and depth of soils, and possibly even lead to their premature withdrawal from agriculture. Many of these adverse effects are due to over-exploitation by intensive agricultural practices needed to maintain and increase yield per acre and overall harvests to support: 1) a U.S. population growing by 25 million or more every decade, 2) diets heavy on meat and dairy products (which require much more land, water and other resources to produce a given amount of protein, calories and other nutrients) and 3) exports of grain, meat and other agricultural products. According to the NRCS, erosion is “the wearing away of the land surface by running water, waves, or moving ice and wind, or by such processes as mass wasting and corrosion (solution and other chemical processes).” The NRCS estimates that, as a result of improved soil conservation measures, soil erosion on the nation’s cropland decreased by 44 percent between 1982 and 2012. Total water (sheet and rill) erosion on U.S. croplands fell from 1.59 billion tons per year to 0.96 billion tons per year, and wind erosion declined from 1.38 billion tons per year to 0.71 billion tons per year. 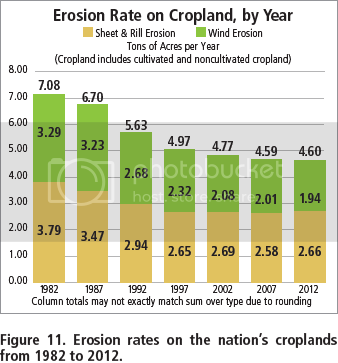 The national erosion rate (measured in tons per acre per year) on cropland declined from 7.08 tons per acre to 4.6 tons per acre (Figure 11). In essence, the potent juxtaposition of relentless development and land degradation from soil erosion and other factors is reducing the productive agricultural land base of the U.S. – even as the pressures on that same land base from a growing population and other causes are intensifying. 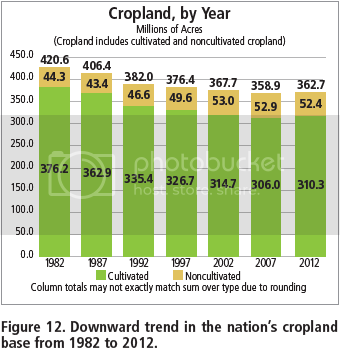 The NRI estimates that the acreage of cropland in the U.S. decreased from 421 million acres in 1982 to 363 million acres in 2010, a decline of 58 million acres (14 percent) in three decades (Figure 12). Some of this cropland (24 million acres in 2012) was withheld from active farming with federal government support and subsidies and placed into the Conservation Reserve Program (CRP), but these tend to be marginal, fragile, erosive or environmentally sensitive sites on which cultivation is not deemed to be sustainable or environmentally appropriate. 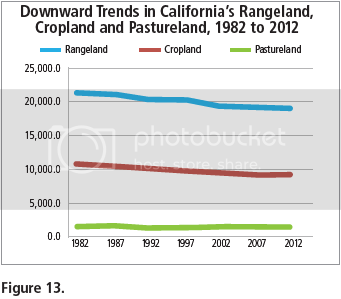 The downward trends of California’s cropland, pastureland and rangeland broadly mirror the national trends (Figure 13). 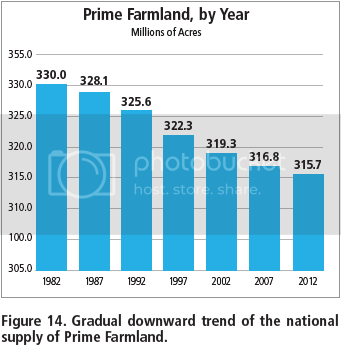 The NRWC defines Prime Farmland as “Land that has the best combination of physical and chemical characteristics for producing food, feed, forage, fiber, and oilseed crops and is also available for these uses.” Nationwide, the supply of Prime Farmland is also trending downward (Figure 14). According to the American Farmland Trust, almost 70,000 acres of high-quality farmland were urbanized in the San Joaquin Valley alone in just the 14 years between 1990 and 2004, and another almost 40,000 acres in Southern California during the same period. In the San Joaquin Valley, nearly 60 percent of all land urbanized in this period was high-quality farmland, a measure of just how fertile Central Valley lands are. 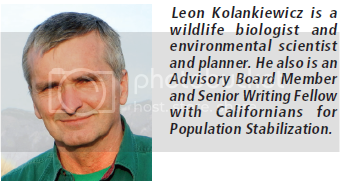 If Californians and Americans allow current demographic and land development trends to proceed unabated, in the coming decades both California and the U.S. will continue to forfeit massive amounts of open space, including valuable wildlife habitat and farmland, to sprawl spreading across the landscape. Our agricultural production will be compromised and our food security potentially jeopardized. During the most recent decade for which data are available, each person added to the U.S. population was correlated with the development of approximately 0.4 acre of previously undeveloped land (all of it natural habitat, open space or farmland). Cumulatively, there is about 0.37 acre of developed land per American. Assuming the same correlation holds through the remainder of the century, adding 200 million new Americans (leading to a population of approximately 525 million in 2100) would entail the development of 75 million additional acres, or 116,000 square miles, of formerly rural land. This is an area about the size of New Mexico, our fifth largest state; it is about 70 percent of the entire area of California, including its large deserts, mountains and forests in the north. Alternatively, it approximates the combined size of Kentucky, Indiana, South Carolina and West Virginia. About 90 percent of this sprawl would be due directly to U.S. population growth, while only 10 percent would be correlated with increasing per capita land consumption. In 2010 there were 113 million acres of developed land in the U.S. Thus, increasing this by 75 million acres would push the total amount of developed land to 188 million acres, or 294,000 square miles in 2100, substantially larger than our second largest state (Texas, at 268,597 square miles). Over large swaths of the U.S., the rural character and charm would vanish. The average urban American would be more isolated from authentic countryside than ever before in our history; our feet would feel asphalt and concrete far more than they ever touch authentic dirt. Our remaining countryside would be ever more beleaguered, and take longer to reach than ever before; once accessed for sight-seeing, hiking, camping or picnicking, open spaces such as state or national parks and forests would be more crowded than ever with fellow “urban refugees” seeking a green reprieve from artificial settings. Wild flora and fauna would decrease and threatened and endangered species would increase. Figure 15 depicts the amount of developed land in the U.S. to the year 2100 under this baseline scenario. 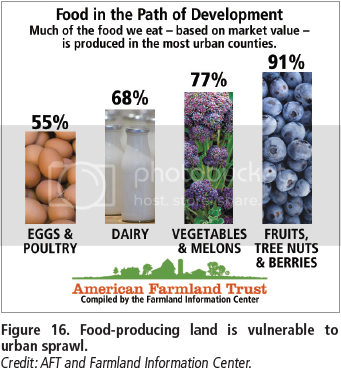 Because farmland tends to be level or nearly so, and flatlands are easier and cheaper to build on than hillsides, and because of the proximity of much farmland to urban areas, where it lies directly in the path of development (Figure 16), much of the acreage for the new development necessitated by 200 million more residents will likely come from the nation’s agricultural land base. 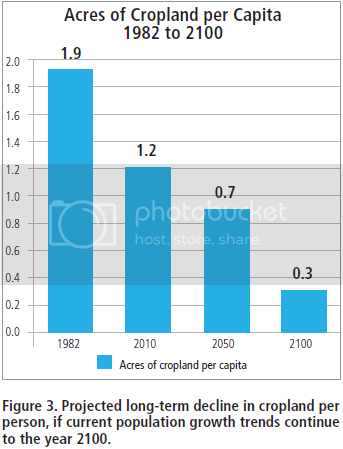 Interpolating and extrapolating from the average rates of cropland loss and population growth in Figure 3, it can be inferred that under the baseline scenario (continuing current trends), cropland per capita would decrease from1.2 acre/person in 2010 to 0.3 acre/person in 2100. At these rates, in 2100 each American would have only 27 percent of the cropland that he or she enjoyed in 2010. Another way of stating this is that agricultural yields (food produced per acre) would have to increase almost four-fold just to maintain per capita food production. In order to retain the moderate food prices and diverse diet to which Americans have become accustomed since World War II, there would have to be extraordinary advances in agricultural productivity through accelerated technological innovation and genetically modified organisms (GMOs) to offset these probable losses in the nation’s productive land base. Simply increasing the use of fertilizers, pesticides and irrigation – all of which worked in the 20th century to raise agricultural output enormously – will not be options. The extent to which output gains induced by future technological advances can cope with likely declines in the available productive land base is a subject of continuing enduring discussion and debate among agricultural scientists, scholars and policymakers. The impact on farmland and cropland loss due to immigration-induced population growth could also be mitigated to some extent by sharpening America’s commitment to implementing Smart Growth programs and farmland protection policies of the sort advocated by conservation groups like the American Farmland Trust (2013). Each of these policies, if successfully implemented at scale, would have the net effect of increasing population density on both existing and future developed land. Americans would have to be willing to accept relatively more apartments and condominiums and relatively fewer and smaller single-family, detached homes with yards. Just how politically and culturally feasible this large shift in public attitudes would be remains uncertain. Two other shifts could also potentially ameliorate the loss of cropland and farmland per capita that current demographic trends are forcing on the U.S. First, America could import more agricultural products from places like Mexico, Chile and Argentina, although if energy and transport prices increase substantially in the future with the ongoing depletion of conventional fossil fuels, this option could become costlier, less feasible and ultimately prohibitive. Second, Americans could embrace less meat and dairy products and more vegetarianism and veganism. While some might criticize this as a loss of dietary freedom, others might endorse it as a healthier diet less prone to cardiovascular disease. Nevertheless, it is well established in the scientific literature that low-meat diets (consuming plant protein and nutrients directly rather than feeding grains to livestock and poultry first) entail substantial environmental benefits via less energy, land and water consumption. These are the profound and contentious issues raised by increasing population pressures on America’s agricultural land base. As the 21st century proceeds, and if Americans continue to acquiesce to the current historically high immigration rates of one million plus annually, these questions will bear down ever harder on the collective American body politic. If, on the other hand, we were to opt for more traditional immigration levels of say, a quarter-million per year, millions of acres of farmland will be kept in production, sustainably growing food for America and a hungry world.